As you may have heard from the Android Dev Summit, we announced that we're expanding support in Android to include Foldables, in preparation for upcoming devices from hardware partners like Samsung. On this new form factor, your application could be transitioned from one screen to another automatically (eg. when folding / unfolding a foldable phone). During this transition, your app will receive a configuration change for the new layout (and possibly density in some cases). To provide a great user experience when changing from one screen to the other, you want to make sure your app properly support runtime configuration change. How to test: Emulators for various devices should become available soon (eg., Samsung will publish a folding / unfolding emulator apk later in Q4 which should work on Samsung Galaxy S4 tablets as well as the AOSP emulator in Android studio). Today, when an app is in multi-window but not focused, it is on the OnPause state. 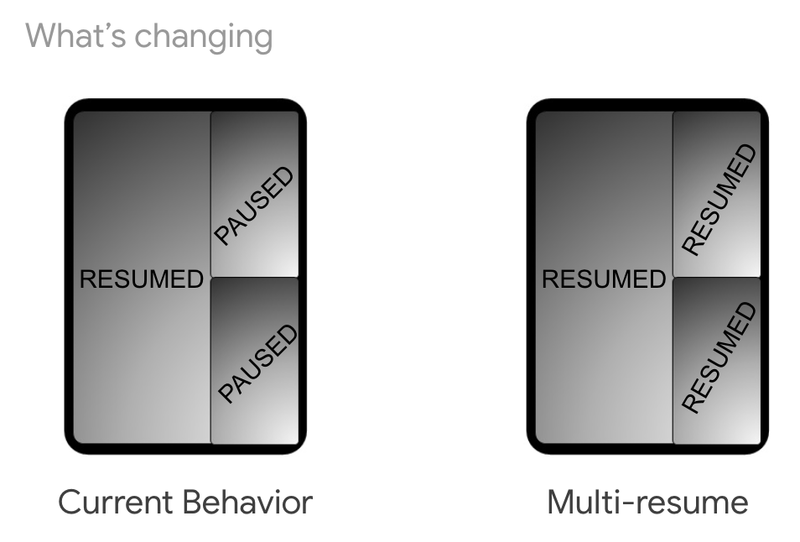 While we provide recommendations on how to support multi-window, we noticed a significant number of apps are not handling the onPause state according to those recommendations (video paused or stopped, instant messages not displayed etc). To help developers provide the best user experience on multi-window with minimal effort, we're allowing device manufacturers to keep all apps resumed when in multi-windows in P.
Note: With the next Android version we're looking into how to optimize compatibility for this behavior. How to test: There are no device at the moment with this behavior but device manufacturers are working to update existing devices to allow developers to test. Stay tuned for more details from device manufacturers. How to test: You can try it out by using the "Developer options > Simulate secondary displays" option. Keep in mind that those simulated display do not process inputs.